Insulating floors will go a long way towards making a property more energy efficient. But gaps, however small, can often compromise good insulation by allowing air leakage that can lead to cold bridging and other issues. This advice is for floor insulation above a concrete floor and below a screed. It’s good practice to fit insulation boards tightly and seal all holes. 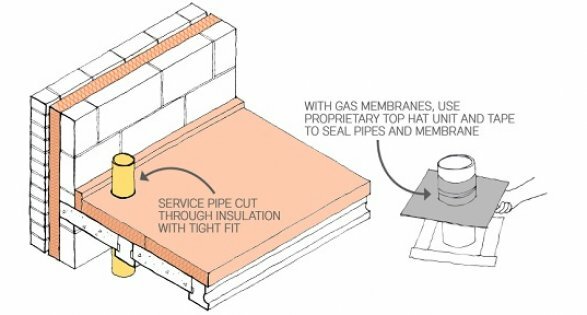 Pay particular attention to service pipes, a major source of leakage – with gas membranes, use a pre-formed top hat unit and tape to seal pipes and the membrane. Overlay floor insulation with a separating layer (DPM) to prevent the screed bleeding through joints. Fit horizontal floor insulation tight with no gaps between boards. Install perimeter floor insulation down to the base of concrete floor and tight to the blockwork. If possible, ‘core drill’ any holes for services to get a tight fit. Restrain perimeter floor insulation to prevent ‘floating’ during screed pour. Stop the screed from bridging the perimeter insulation. Find out more solutions to common problems by downloading the free Builders’ Book, an informative guide that promotes good workmanship by helping you identify and rectify the most common energy efficiency-related problems in construction.